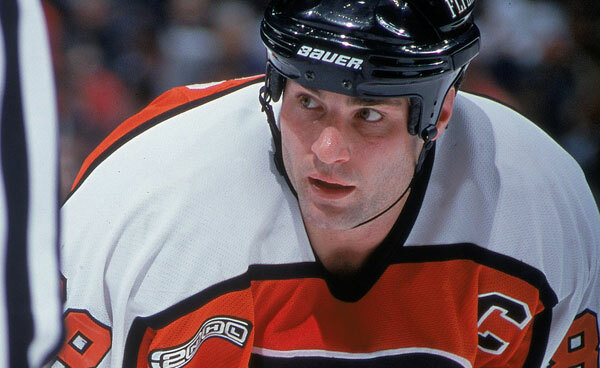 The name Eric Lindros certainly brings back a lot of memories for me. I can categorize the memories into three groups (before the NHL draft, his playing days and his legacy). Before he was drafted, I don’t think I have seen another player come into the NHL with the same amount of hype (that even includes Crosby and Ovechkin). Score went as far as to ensure that they were the only company with an NHL license that could print his cards. For what it is worth, he was every bit as good as a junior player as people expected. 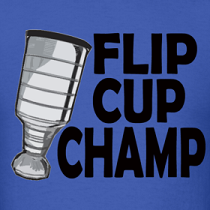 He was a man playing against boys and his World Junior medals, and Canada Cup Championship only proved his ability at a young age. Then the draft fiasco happened, and I would like to avoid that one. It was pretty much beaten to death at the time and when you reflect on the trade that did eventually occur between the Nordiques and Flyers, I think the Nordiques ended up getting more than fair market value for Eric. When Lindros finally got a chance to wear an NHL uniform, it was clear that he belonged in the NHL and he was going to be good! It didn’t take long before Eric was one of the game’s elite players and I would even argue for a period of time was the BEST player on the planet. Eric was the key component to two very famous Philadelphia lines, the “Legion of Doom” and the less known “Crazy 8’s line”. From 1993-1997, Eric was in the top 3 each season in points per game including his NHL leading 1.52 points per game in the strike shortened 94-95 season. In addition to offensive number, Lindros played a dominating physical game that could chance the momentum of the game at any time. It is this combination of physical punishment and offensive skill that set him apart from many other players. Injuries certainly took their toll on his career numbers, but upon his retirement he was still averaging nearly half a goal a game and 1.14 points per game. His 865 career points might not seems as impressive as some, but he did it in just 760 games which are 200 fewer games than NHL Hall of Famer Yvan Cournoyer who has 863 career points. What does separate the two of them is their Stanley Cup totals which Lindros unfortunately was never able to win any. I remember two things from my childhood about Eric Lindros. One was getting “Fire On Ice”, an Eric Lindros biography as a kid for Christmas from my Grandma. The other was the crazy lengths and prices collectors would pay for a Lindros rookie. I remember at one point Score Canadian versions of Eric’s rookie were selling for close to 30 bucks and EVERYONE who owned one had it in a screw-down case and thought it would be worth hundreds some day. 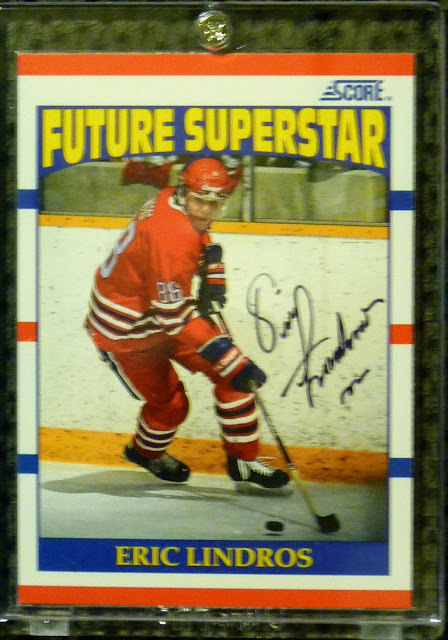 As a result of my collecting in the early 90’s I now own a few of these Future Superstar rookies of Eric Lindros so I thought they would make a perfect card to send to Eric to be signed. One reason is recently Score re-released a few signed versions of this classic card and one sold for over $2000! Knowing I could never afford such a card, the next best thing is to ask Eric if he could make me one! Here is the autograph, and it is a beauty! Great penmanship and his choice of a fine-tip sharpie just make the card look amazing to me. The unsigned versions of these rookies can be had in mint condition for as little as a buck at most places. What some people don’t know is Score issued a second Lindros card as part of their Rookie and Traded set. Technically it isn’t a rookie card, but I personally think it is every bit a rookie card as the other version. 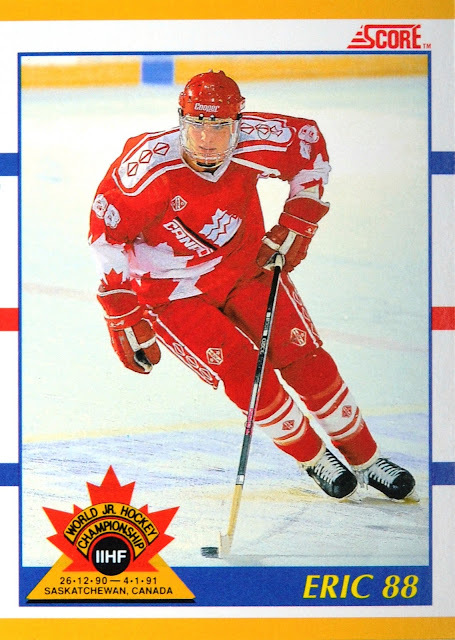 This card shows him in his World Junior Team Canada jersey where he owned the tournament with 17 points. UD cheated that year and included an image of Lindros with the other two captains of Team Canada that year, but due to an exclusive deal with Lindros, Score was the only company that could make a Lindros “rookie”. There you have it, a return from a possible future Hall of Famer and certainly an auto from someone I idolized as a kid! Do you have any Lindros memories? It's like going down memory lane with your posts. Anyone else worried that Crosby is heading down the same road as Lindros? Thanks for the comments guys. Johan Jonsson looks like he has a story to tell about that one for sure! I am hoping that Crosby's health issues whatever they turn out to be are treatable and aren't chronic like Eric or Pat Lafontaine's ended up being.